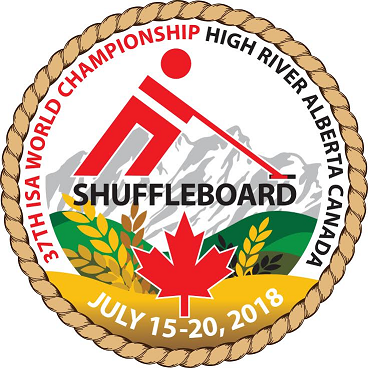 The 37th International Shuffleboard Association (ISA) World Shuffleboard Championship took place in High River from July 15 to 20 at the Bob Snodgrass Recreation Complex (BSRC). A total of 24 teams participated, equaling 96 players from various countries including Australia, Brazil, Japan, United Kingdom, Austria, Germany, Vietnam, United States, the Netherlands and Canada, Ken Wardley, event co-ordinator, said. For the women’s, team Germany was the champion, and for the men’s the Canada “D” team won first. Brian Bissillion, from team Canada “D”, told the Times it was the week-long competition as a whole that made him and his team do well. “We had a really good team, we all played well, and I thought we had a good week,” Bissillion said. Irene Hoffmanns, from team Germany, said it was surprising for her and her team to make it to the championship game. In 2019, the 38th ISA World Championship will take place in Vienna, Austria, which Wardley said is a singles tournament. In 2020, the 39th ISA World Championship will happen in Australia, which is a doubles tournament, he added. “We just had a great time, everything went smooth, and it was just absolutely fantastic. Everybody enjoyed it,” he said. Throughout the week attendees enjoyed a meet and greet, opening and closing ceremonies and tours of High River, the East Longview Hall and the Bar U Ranch National Historic Site, among other activities. A highlight from the event for Wardley was having everything run smoothly. “I believe that … the awards banquet is the culmination of two years of hard work,” he said regarding the banquet held to close out the competition. As reported, Wardley said they initially applied to the ISA two years ago and received confirmation of the town being the host site in October 2016. Wardley said he received one comment in particular from attendees. Wardley extended his gratitude to High River residents, town council and staff members with the BSRC for their support.